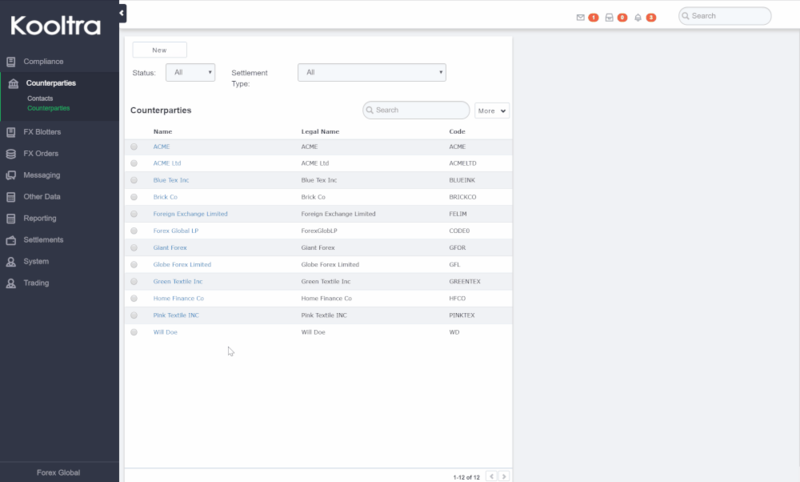 Salesforce (SF) has a powerful reporting that can be used to build simple to complex reports on any field(s)/objects in the Kooltra. The reports are displayed in a table like view with rows and columns that can be filtered, grouped, or displayed in graphical charts. SF reports can help you analyze a large volumes of data allowing you to answer answer complex questions and develop actionable business insights. 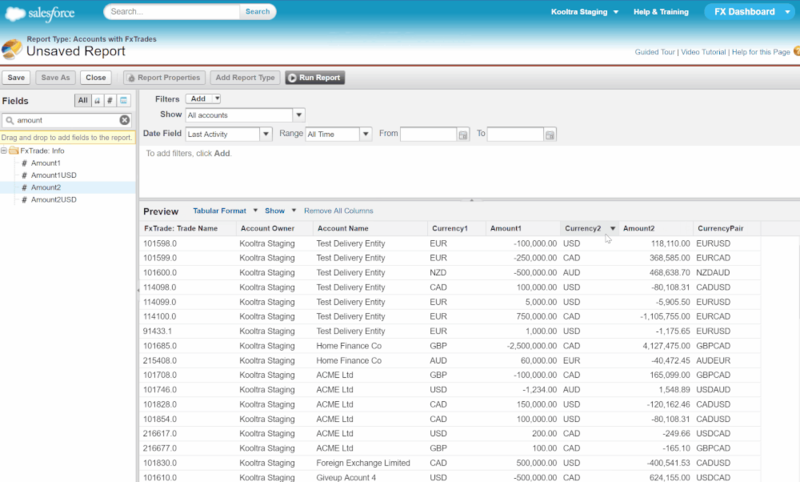 To access Custom Reports, click on Reporting > Custom Reports in the navigation pane. Without the needs of knowing complex programming languages like SQL, SF comes with a built-in handy tool, allowing you to create reports through a point-and-click, drag-and-drop interface. In the following example, we'll explore building a SF Report to display all CAD trades under account Giant Forex. Video illustrations of this process is shown below. 1. Click on the New Report Button. In the Create New Report page, type FxTrades in the Quick Find bar and select Account with FxTrades. Note that Salesforce by default creates a variety of different report types. Click Create. This will take you to the Report Builder Page. 2. By default, SF report will show fields such as Account Owner, Account Name, Last Modified Date and FxTrade: Trade Name. Note that you are able to remove columns from the report by clicking, holding and dragging the Field Name to the left navigation bar. 3. All available fields for the report that are shown in the left hand navigation menu. The desired fields can be added to the report by dragging them in. In our example, we will drag out default fields Type, Last Modified Date and Billing State/Province and drag in Amounts and Currency. 4. To create a report showing all CAD trades associated with Client Giant Forex add the filter Account Name equals Giant Forex and StandardPairName contains CAD. Salesforce will show you a preview of your report as soon as you add the filters. (Note the Show field was changed to All Accounts and the Date Field was changed to Last Activity: All Time). 5. Click Run Report. This will take you to the Report Page. You can save the report by clicking Save As. Enter the specified information and click Save & Return to Report to go back to the Report page. Note that saving the report to the My Personal Custom Reports folder means that no other users will be able to access to this report. If you would like to share this report with other users, you will need to change the sharing settings in the folder that you are saving the report into. In the Report page, you can also schedule the report to run at certain intervals. To schedule a report run, click Run Report > Schedule Future Runs. You can then select which users receive the report and at which interval they receive it at. For this example, we'll set the report to be sent to the person creating the report every Monday at 9am. Once you've configured your schedule, click on Save Report Schedule. Note that you are also able to schedule this report to send to multiple users in your org by checking "To me and/or others" highlighted in blue. You can then select the type of users such as Customer Portal Users or Admin Users and add them to the "Sent Email To" list. As a result, the report will be automatically scheduled to notify selected users on a daily/weekly/monthly basis. When you subscribe to a report, you can define the set of conditions to meet before sending a notification, and choose how and when to be notified. In the following example, we set the condition to be "Users will be notified when the record count exceeds 200", resulting a mobile notification And an email notification being sent on a daily basis. Make sure to save any changes to your report before subscribing.